This chemical poison is listed only in the "moderately high-risk" level of risk categories. Yet the reality is that fluoride is a very dangerous chemical with serious risks of harm to both health and the environment. In truth, there are actually two different forms of what is called fluoride - calcium fluoride and sodium fluoride. 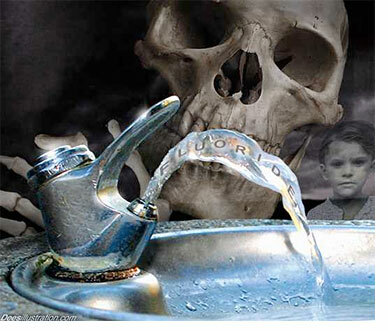 The results of having water supplies contaminated with fluoride reads like a laundry list of health problems: cancer, genetic DNA damage, obesity, thyroid disruption, reduced IQ, lethargy, chronic fatigue, inability to focus, Alzheimer's disease, accelerated aging, sleep disruption, brain disorders, calcification of the pineal gland, etc. Interestingly enough, sodium fluoride also causes dental fluorosis, a yellowing and hardening of the teeth that causes teeth to break and wear down. This is quite ironic considering that the ADA promotes fluoride as an additive that prevents decay and promotes healthy teeth. The distinction in BfR's results between calcium fluoride and sodium fluoride is not readily made and, as is so often the case, the devil is in the details. Throughout the published study, all forms of fluoride are constantly referred to simply as "fluoride" with no delineation as to which form is being discussed, except by contextualization and observation. Occasionally, a specific form will be mentioned but, for the most part, the umbrella term "fluoride" is sufficient for the purpose of these researchers. This is how the toxin comes to be classified as a mineral and henceforth a nutrient. Indeed, in the section which discusses the sources of fluoride intake BfR states, "Fluoride is taken up from solid foods, drinking water, mineral water, black tea, fluoride-containing toothpaste, dental care products, fluoridised table salt and, eventually, from fluoride-containing medicinal products." There is clearly no distinction here between the different forms of fluoride. BfR is obviously aware of at least some dangers of fluoride, such as dental and skeletal fluorosis, as well as the more serious health problems. The report states, "There are reports of acute fluoride intoxications in people caused by accidents, attempted suicide, or erroneous fluoridation of drinking water. The symptoms are nausea, vomiting, abdominal pain, diarrhea, heavy salivation, cardiac arrest, cramps and coma. Severe hypocalcaemias were observed. 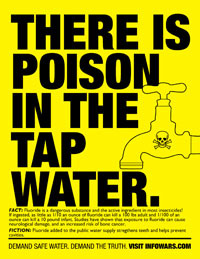 An amount of 5-10 g fluoride has been calculated as the ‘certainly lethal dose' = CLD for adults."